Walking into the Reel Inn in Malibu with sand between my toes is one of my favorite summer activities. We have to visit this funky order-at-the-counter and serve-yourself fresh fish market/cafe at least twice a year. There is always a line to order your fresh grilled fish meal. Sometimes it’s out the door, other times it’s near the large fish aquarium. No worries, it moves quickly and there are plenty of seats inside and out on the patio. 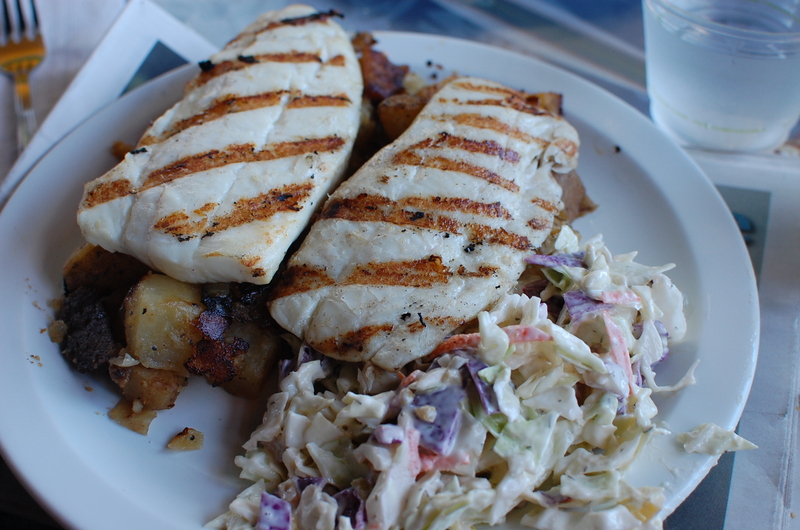 Last Sunday we ordered fresh halibut and swordfish for $17.95 each. All the items offered are listed on a big chalkboard. Give the cashier your name and it will be called once the fish is grilled. The white plastic plate always has a generous portion of fish, plus a side of delicious potatoes with grilled onions and a chunky cole slaw. It’s not ocean-front dining, however if you snag a wood booth next to the window, you can sneak a peek at the glorious Pacific Ocean beyond the line of cars on PCH. It’s a great stop, allow the traffic its time to die down, and then head home after a wonderful day at the beach. We’ve been coming since our oldest was in her infant seat. Sometimes we sit inside, but during the summer we grab a table on the wood deck or down on the gravel patio. Beers on draft at $5 and a glass of house Chablis or burgundy is only $3.50. Share 1/2 a carafe for $6.50. There has been a threat for years that this dining dive will close. The nearby market and old motel are long gone. I’m always pleasantly pleased when I see the sign out front with some corny saying like – “Green Eggs and Clams.” Oh now that sounds appetizing. Don’t expect fine dining or impeccable service. This is a great beach/surfer place to sit down to a nice piece of grilled fish and a cold beer.